Workman Publishing Company, 9780761121107, 464pp. 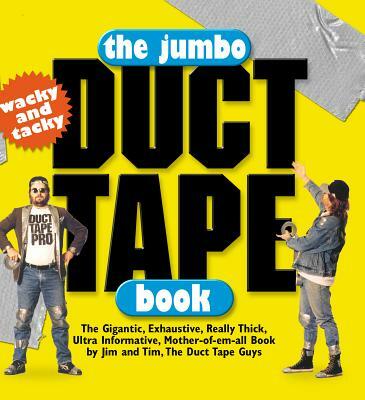 With two-thirds of the material drawn from their previous books and calendars and one-third all-new, The Jumbo Duct Tape Book is pure nuttiness to the nth degree. The premise is right there, on page one: "One rule can get you through life. It if ain't stuck and it's supposed to be, duct tape it." But of course it's the interpretation that counts-like duct taping the gas pedal for cruise control, or duct taping marbles to your pressure points for instant reflexology. And then there's bending the rule-transforming sneakers into golf shoes by punching nails through duct tape and taping it to the soles, saving energy by taping all switches in the off position. Plus cosmetic dentistry (use white tape for the "The Mask" look, silver for the metal-mouth bad guy look), cell phone safety (tape phone to side of head while driving so hands stay on wheel), home decorating (use duct tape for easy drapery tie-backs). You can even convert the book to a "hard cover" by taping a piece of 1/4 inch sheet of plate steel to the front and back covers. It'll last for years! Jim Berg, with Tim Nyberg, started the duct tape craze in 1994 with the publication of their bestselling The Duct Tape Book. They are relentless proselytizers for duct tape and host the hugely popular, mega-award-winning www.ducttapeguys.com Web site. Tim Nyberg, with Jim Berg, started the duct tape craze in 1994 with the publication of their bestselling The Duct Tape Book. They are relentless proselytizers for duct tape and host the hugely popular, mega-award-winning www.ducttapeguys.com Web site.